‘Timing’ the markets. Buy low and sell high – that is the aspiration of investors who look to time their entry into and out of the equity markets to generate returns. The idea is simple, yet few have been successful in executing a strategy that times the markets. ‘Time In’ the markets. Missing just a few of the best performing trading days can be significantly detrimental to returns. Total returns for the MSCI EM Index since 1/3/2000 until 10/30/2015 has been 151%, but this number falls sharply if the best daily returns are excluded. 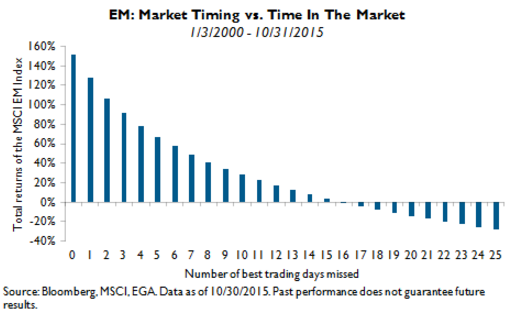 As the chart shows, if the 16 best trading days out of 4,131 total days were missed, the total return of the MSCI EM Index drops to below zero. Missing the best 25 days brings investors significantly below zero. We believe that investors should consider that ‘timing’ the markets is not as important as ‘time in’ the markets.